Our sister magazine has some great food tips for Provincetown. During any PTown vacation, eateries are always busy and offer an amazing selection. We have chosen eight places that we love and you need to try! Fanizzi’sis a favorite with both tourists and locals. Fanizzi’s bayside dining room boasts 180 degree views through three walls of windows that look upon Cape Cod Bay, Provincetown Harbor, North Truro, and Truro. “The Short List” says Fanizzi’s is the best place for Burgers! 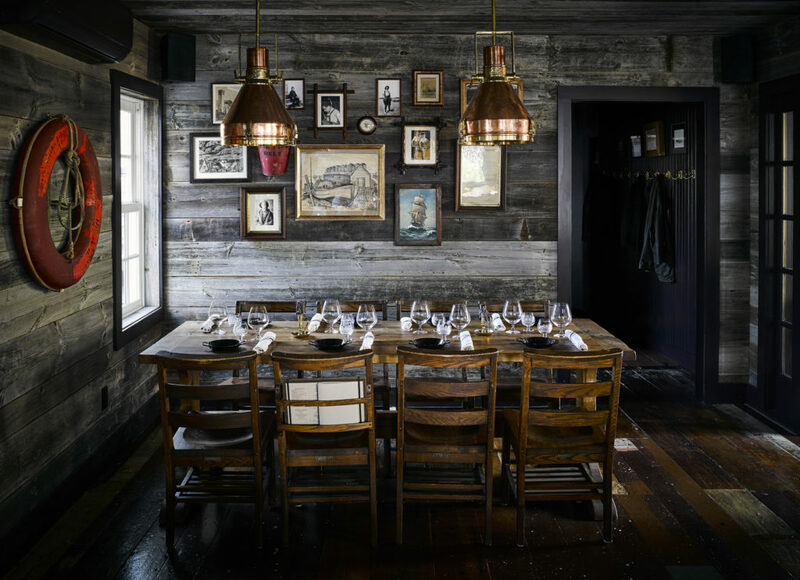 Strangers and Saints is the new kid on the block this year and is a modern interpretation of a portside tavern – blending the history of sea captain salt, swank and swagger with the deep sense of hospitality, food and drink. The featured image of this article is Strangers and Saints interior and you can see how amazingly styled it is. The lively tavern atmosphere offers Mediterranean-inspired cooking comprised of small and large shareable plates, handcrafted cocktails, wine and local beer. The focus is on pure, simple ingredients brought together in imaginative and unexpected ways. Happy hour from 4 – 6pm. Dinner from 5pm. The Lobster Pot is not only one of the best places for lobsters, its an iconic landmark slap bang in the middle of Provincetown. So many people meet outside it, opposite it and near it; many go in and eat there too. Of course lobster is a big part of the menu, but there is a great bar upstairs and if you are not that into seafood, but all your friends are, don’t worry there is a plenty of meat on the menu too. It gets packed all through the season so book ahead and make sure you are on time! We first featured Tin Pan Alley four years ago in our guide. They have gone from strength to strength, and not only serve great food, but wonderful cabaret too! They have been named one the 11 Hottest Restaurants on the Cape and Islands! They serve a mean Tuna Nicoise at lunchtime and great Tin Pan Alley Martini’s! Victor’sis PTown’s culinary hot-spot according to the Boston Herald, and many agree, including diners who voted Victor’s a winner at last years opentable awards. Victor’s is one of the few places that stays open all year round! Get along and sample an array of seafood to die for! Ross’ Grill is one of Provincetown’s most talked about dining experiences overlooking Provincetown Harbor at Whalers Wharf. The view is one of the best in town. Enjoy signature cocktails and fine wines. Napi’s is a unique restaurant located on a winding street full of colorful sunflowers and roses, a block away from the hustle and bustle of town. Surrounded by the works of local artists, antique stained glass and carousel horses, you will enjoy the varied menu of Napi and Helen’s favorite dishes from around the world.